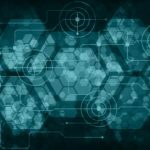 As an EMC consultant, it seems that lately I’ve run into many client projects where radiated immunity has cropped up as the major issue. One reason for this may be the trend in using digital and analog circuits that are powered by 3.3 volts, and lower, which decreases noise margins significantly. Sensitive analog circuitry is also greatly affected. The compliance testing for radiated immunity for most commercial products is based on the international standard, IEC 61000-4-3, and is usually performed from 80 to 1,000 MHz (sometimes to 2,000 MHz) at e-field levels from 3 to 20 V/m, depending on the product environment or application. Some military, vehicular or aerospace applications require testing to 200 to 1,000 V/m, and frequencies up to 18 GHz or more. 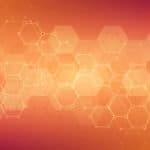 In this article, I’d like to describe several low cost methods for creating strong RF fields, which may be used to characterize the RF susceptibility of your product. One low-cost technique for quick troubleshooting is to use one of the license-free portable Family Radio Service (FRS) FM two-way radios to transmit close to the sensitive areas of the product (Figure 1). These radios transmit near 465 MHz with a power level of 1/2 Watt. While limited in frequency range, many RF susceptibility problems have been located and resolved using this simple tool. Figure 1. In a pinch, try transmitting using one of the low-cost and license-free FRS two-way radios. Other (mostly) license-free tools would include a portable CB radio (27 MHz) and a transmitting cellular (or PCS) mobile phone (varies from 700 to 1900 MHz). Table 6.1 lists several (mostly) license-free transmitters that may be used to test radiated susceptibility in select frequency bands. The GMRS transmitter requires a license. Using Equation 1, we can calculate the expected E-field level in volts/meter given the transmitter output power in watts. 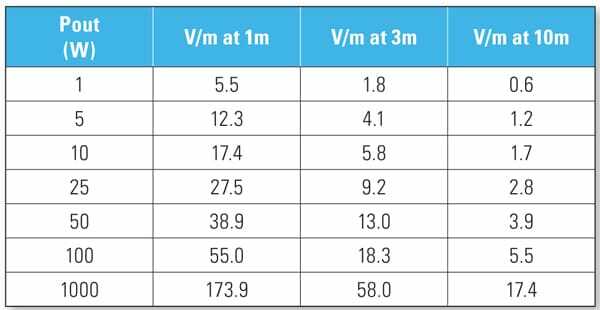 Table 1 indicates some E-field levels for various power levels. Table 1. A chart of calculated E-fields in V/m (assuming an antenna gain of 1). Figure 2. 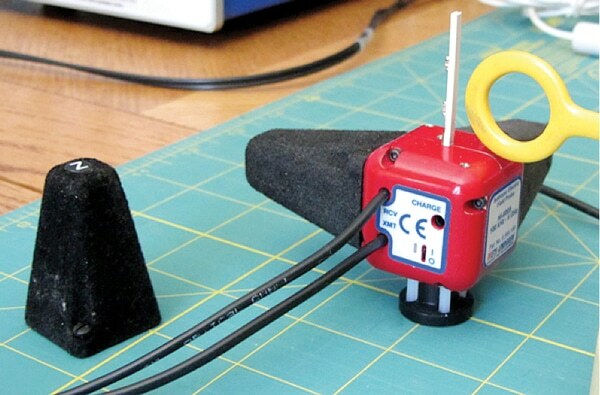 One of the best troubleshooting setups for radiated susceptibility is an RF generator connected to a small H-field probe. The probe will quickly identify sensitive areas or cables of your product. 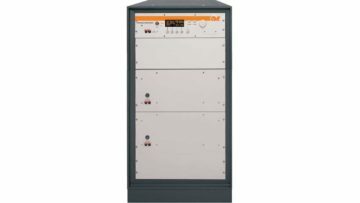 By adjusting the generator frequency and RF output level, you may be able to zero in very quickly. With this small medical product, we were able to identify a single ribbon cable (of several) that was susceptible at about 950 MHz. Another very good troubleshooting technique that’s tunable over a range of frequencies is to obtain a bench top RF generator and connect this to a small E-field or H-field loop probe (Figure 2). Generators that can produce at least +10 to +20 dBm work the best – the higher, the better. 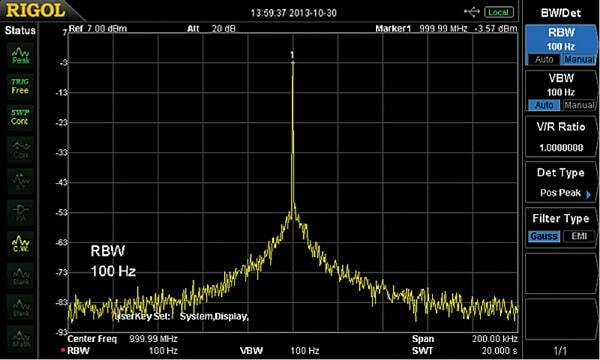 A plus would be the ability to apply 80% AM-modulation to the RF at 1000 Hz. This will more closely match the requirements of the immunity standard. 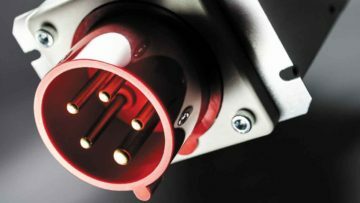 This will produce an intense RF field (up to 10 V/m, or more), which may then be probed around cables, connectors or internal circuitry. You’ll need some way to monitor the proper operation of your product. Watch for disruptions during the probing. If the small loop probes cause no susceptibility to the product, try taking a longer piece of wire and wrapping it with loose turns around and along the length of each I/O or power cable to couple in the RF more efficiently. Then connect this wire to the RF generator output. While I’ve seldom needed it, in extreme cases, you may need to obtain a 10 to 20 W broadband power amplifier to boost the RF output from the generator. You could use a simple dipole antenna, such as a TV rabbit ears or DIY dipole antenna made from two lengths of wire cut to the approximate quarter wavelength (each side) of the frequency band that may be an issue and connect one side to the shield and one to the center wire of a coax cable. Note that this test with the power amplifier should be performed in a shielded room to prevent interference to existing communications or broadcast services. Recently, there have been a handful of small USB-powered RF synthesizers available at low cost. One affordable solution is the “TPI Synthesizer” from Trinity Power, Inc. (http://www.rf-consultant.com). This small module can produce up to +17 dBm and can tune from 35 to 4400 MHz in user definable steps of as little as 1 kHz. It is USB-controlled and includes PC software that controls frequency, sweep limits, step size and three levels of power output. You can also control or sweep the power level in definable steps. I’ve successfully used the software with my Windows 8.1 OS operating under Parallels 9 on my Macbook Pro laptop. Figure 4. The RF output from the TPI Synthesizer is fairly low in phase noise, but the higher order harmonics are only 10 dB down from the fundamental. Figure 3. 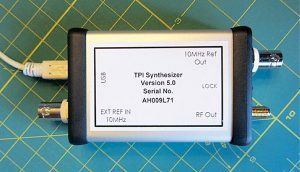 The TPI Synthesizer from Trinity Power is about 2 by 3.5 inches and can produce up to +17 dBm from 35 to 4400 MHz. Another good option is the Windfreak Technologies “SynthNV” shown in Figure 5 (http://www.windfreaktech.com), which also includes the means to AM or pulse-modulate the RF. This RF generator tunes from 35 to 4400 MHz in 1 kHz steps and can produce up to +19 dBm output into 50 Ohms. While more than double the cost of the TPI Synthesizer, it also has the means to measure RF power levels and can be configured as a simple network analyzer. The RF output is also variable up to +19 dBm (almost 100mW). Figure 5. The Windfreak Technologies model SynthNV RF generator is USB-controlled and tunes from 35 to 4400 MHz. It can also AM-modulate the RF output at 1 kHz, according to the radiated immunity standard IEC 61000-4-3. Image courtesy of Windfreak Technologies. It is also USB-controlled using provided software based on National Instruments Labview. The Labview “engine” is provided at no extra charge. There’s also a simple controller software available based on the Android OS. The SynthNV uses basically the same Analog Devices ADF4351 PLL synthesizer IC as the TPI Synthesizer, so the RF output and higher order harmonics look much the same. Figure 6. The well laid out control panel for the SynthNV RF synthesizer. Figure 7. The control panel for the RF sweeper function allows setting of lower and upper frequency limits, as well as step size of 1 kHz to 100 MHz. As mentioned in the caption of Figure 4, one potential disadvantage of both these synthesizers is that the second order harmonic is just 10 dB down from the fundamental, so during immunity testing, you’re effectively testing at a couple frequencies simultaneously – the fundamental at, say +19 dBm and the second harmonic at +9 dBm. Admittedly, this is a 10:1 power ratio, so may not be that much an issue. The third harmonic (and higher order) is another 8 dB down (or more), so probably doesn’t enter into the equation. By attaching an H-field or E-field probe to the output, you can probe interior areas of your product’s PC board and discover sensitive areas that may need filtering or shielding. The nice thing about adding 1000 Hz 80% AM modulation is that it can help reveal “audio rectification” issues (generally in analog circuitry). This occurs when semiconductor junctions act as detectors and rectify the modulated RF, causing bias changes in op-amps, for example. One thing I noticed during my testing and review of the SynthNV is the regular narrow glitches occurring during the peak modulation cycles. These can only be seen on a very fast oscilloscope (1 GHz bandwidth). I suspect, however, these glitches would not be a real issue during immunity troubleshooting. If anything, they may “over-test” the product being characterized. The designer is looking into this anomaly. I might also point out that due to the “fractional-N” PLL, it’s not possible to exactly tune the modulation frequency to 1000 Hz. The closest it will get is 1008 Hz. Figure 9. The simple setup used to measure several near field probes. The protective shroud around the “Z-axis” antenna was removed to allow the probe to come with 2mm of the antenna element. This helped simulate applying RF fields close to a circuit trace. To help characterize the expected E-field levels from various near field probes (both E-field and H-field), they were measured using an ETS-Lindgren field sensor. The probes were either driven by the TPI Synthesizer or SynthNV synthesizer at the full power of each (+17 to +19 dBm output). 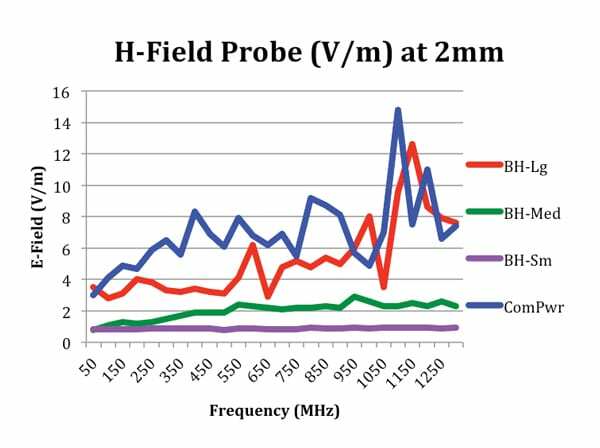 The three sizes of Beehive Electronics H-field and the Com-Power H-field probes were measured at various frequencies from 50 to 1300 MHz. See Figure 10. 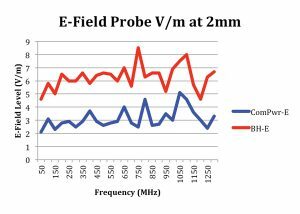 The E-field probes were a bit flatter in response, as you might expect, because they don’t have much of an effective L-C network, being essentially electrically short monopole antennas. See Figure 11. Figure 10. 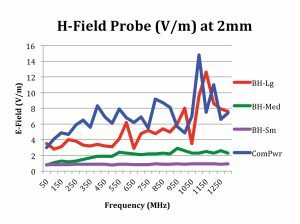 The E-field levels from several H-field probes. “BH”=Beehive Electronics (Large, Medium, and Small). 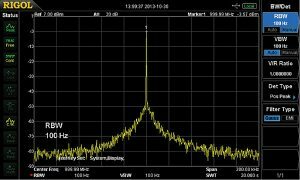 Both the large Beehive and Com-Power probes appeared to resonate above 1000 MHz. Figure 11. 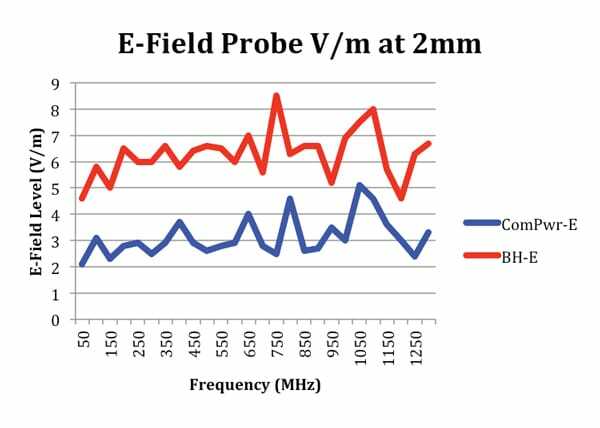 The Com-Power and Beehive E-field probes were both measured versus frequency. The field level was much flatter than the H-field probes. The advantage of the near field probes is that the field level falls off rapidly with distance, thus it’s easier to evaluate separate sections of your circuitry to determine the precise areas of susceptibility. See Figure 12 for a plot of field level versus distance. By 3 to 4 cm, the field is essentially 1 V/m, or less. Figure 12. 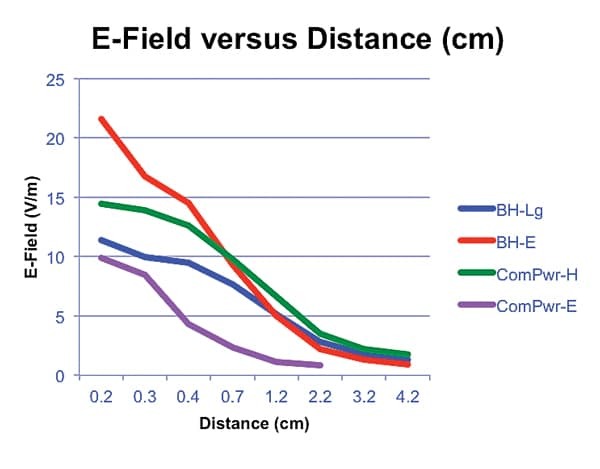 E-field level of several near field probes versus distance. The highest field levels occur within about 1cm from the probe tip. Figure 13. Using the SynthNV from Windfreak Technologies to evaluate the Raspberry PI embedded processor. 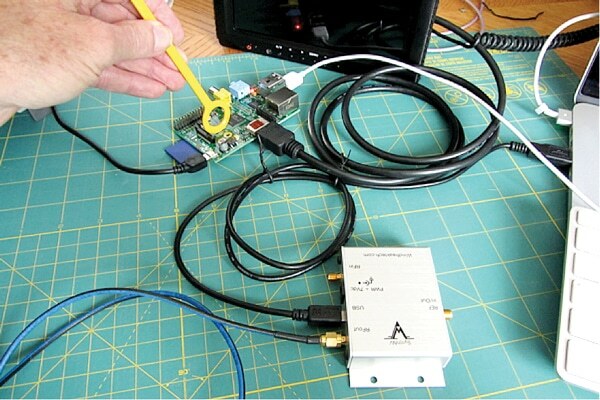 Figure 13 shows me probing a Raspberry PI embedded processor. 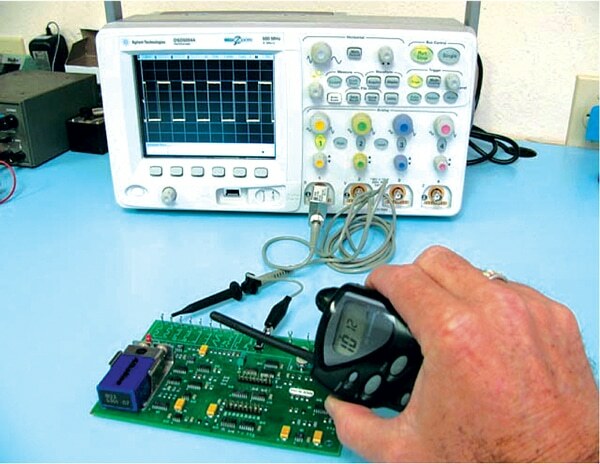 By sweeping the probe around the PC board and I/O cables at various frequencies, you can be fairly sure your product will operate OK during the actual compliance testing. If you’re wondering, the Raspberry PI was immune to the RF levels I was able to introduce. 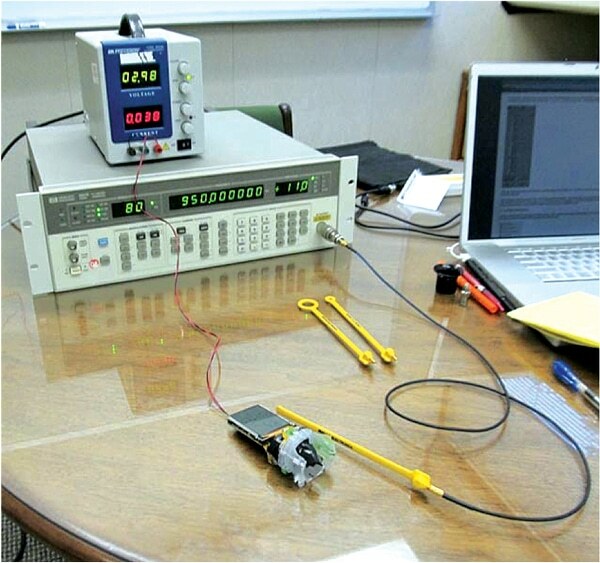 RF generators can drive near E-field or H-field probes to create strong localized E-fields for pre-compliance testing. 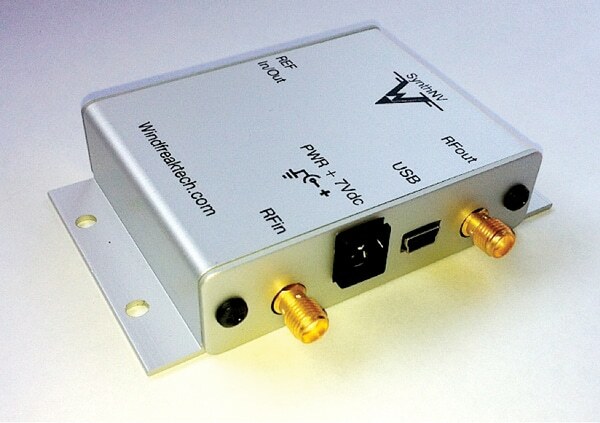 There are low-cost RF synthesizers available now that may replace larger bench top instruments. Localized RF fields of 2 to 15 V/m may be generated to help diagnose radiated immunity issues with a product. Kenneth Wyatt, Sr. EMC Engineer, Wyatt Technical Services, LLC, holds degrees in biology and electronic engineering and has worked as a product development engineer for 10 years at various aerospace firms on projects ranging from DC-DC power converters to RF and microwave systems for shipboard and space systems. For over 20 years, he worked as a senior EMC engineer for Hewlett-Packard and Agilent Technologies in Colorado Springs where he provided comprehensive EMC design and troubleshooting services and managed the product compliance test facility. During that time, he provided EMC training and corporate leadership for EMC. A prolific author and presenter, he has written or presented topics including RF amplifier design, RF network analysis software, EMC design and troubleshooting of products and use of harmonic comb generators for predicting shielding effectiveness. His specialty is EMI troubleshooting and is a co-author of the popular EMC Pocket Guide. He has been published in magazines such as, RF Design, Test & Measurement World, EMC Design & Test, Electronic Design, EDN, InCompliance, Interference technology, Microwave Journal, HP Journal and several others. He coauthored The EMC Pocket Guide (SciTech Publishers) and writes The EMC Blog for www.EDN.com. Kenneth is a senior member of the IEEE and a long time member of the EMC Society where he served as their official photographer for 10 years. He may be contacted at ken@emcseminars.com or www.emc-seminars.com. This is a good article but I need to point out one issue that was not addressed. 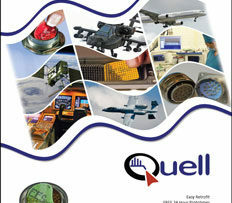 In particular the section discussing the use of programmable RF generators and RF amplifiers. The pictures in the article seem to show the testing being performed in something other than a shield room environment. If so radiated RF emissions of the test equipment must comply with FCC Title 47 CFR Part 15 regulations. For much of the 80-2000 MHz spectrum referenced in the article this will be 30-250 uV/m measured at 3 meters depending on the frequency. That is micro Volts per meter. As an example, at 100 MHz with +10 dBm at the antenna input the effective gain of the antenna would need to be -76 dBi to be below the 30 uV/m limit. Conversely for a 0 dBi antenna the maximum RF input would -66 dBm. If you radiate RF electric fields that exceed the limits in this statute you are violating Federal law. Unless the testing is performed in a shield room, any of the RF synthesizers listed in the article connected to an antenna without an amplifier can exceed these limits. Using a 10W to 20W amplifier, forget about it. The test setup discussed in the article would be considered an intentional radiator of RF energy so there are also numerous segments of RF spectrum where NO RF radiation is allowed. Violation of these regulations can result in penalties of up to $10,000 and one year imprisonment. I personally would not recommend using those specific test methods outside of a shield room. Otherwise, as Clint Eastwood would say, \”Do you feel lucky?\”. Hi Jim, I appreciate your highlighting some of the interference-related issues in radiated immunity testing. I agree readers are certainly cautioned about using antennas with this type of setup outside of a shielded room. However, the field strength from the near field probes specified in the article drops to essentially zero after a few cm, as demonstrated by the measurements. Finally, I did caution the readers regarding the use of higher powered amplifiers. I would argue that this technique is a safe and non-interferring way to perform pre-qualification testing on products or systems. Thanks again for your thoughts.